A pivot is a node that serves as a pivot point for its child nodes and enables to easily control transformation (mainly rotation) of this group of nodes. It has virtually zero influence on performance and shares all common options that other nodes have. Landing gears of an aircraft so that they are geared down and up relative to this point. Propeller blades of a helicopter so that they are rotated relative to this point. The pivot node has the pivot and local transformation matrices. The pivot transformation matrix sets transformation of the basis of rotation (the pivot point) of child nodes. The local transformation matrix sets local transformation of child nodes relative to the pivot point. Both matrices can be edited in the Node Pivot tab of the Parameters window of UnigineEditor. To add a new pivot node via UnigineEditor, click Create -> Node -> Pivot on the Menu bar and then click somewhere in the scene to add the pivot node. By default, the pivot and local transformation matrices of the added node are equal to identity matrices. You can change them in the Node Pivot tab of the Parameters window. 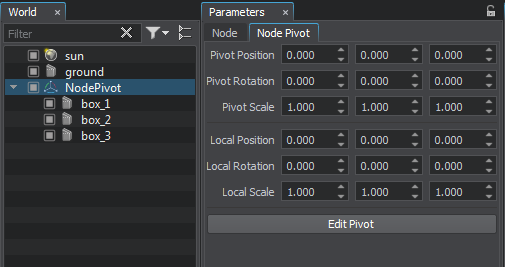 Editing the pivot node implies changing its pivot and local transformation matrices in the Node Pivot tab of the Parameters window. You should distinguish between the concepts of the pivot node and the pivot point: changing transformation of the pivot point doesn't affect the pivot node and vice versa. By default, their transformations coincide. 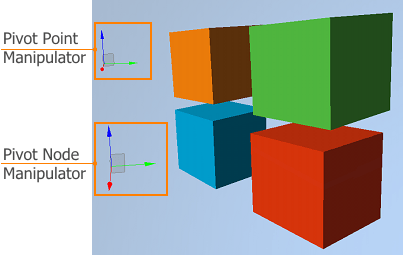 Transformation of the pivot node is edited in the Node tab of the Parameters window. To edit the pivot point transformation, you should select the pivot node and switch to the Node Pivot tab. 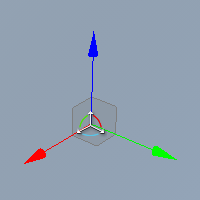 As a result, 2 manipulators will appear: the smaller manipulator for the pivot point and the bigger one for the pivot node. To change the pivot point transformation press Edit Pivot and change the required values on the Node Pivot tab or transform the manipulator. If the Edit pPvot button is pressed, changing the pivot point manipulator will change the pivot point transformation. 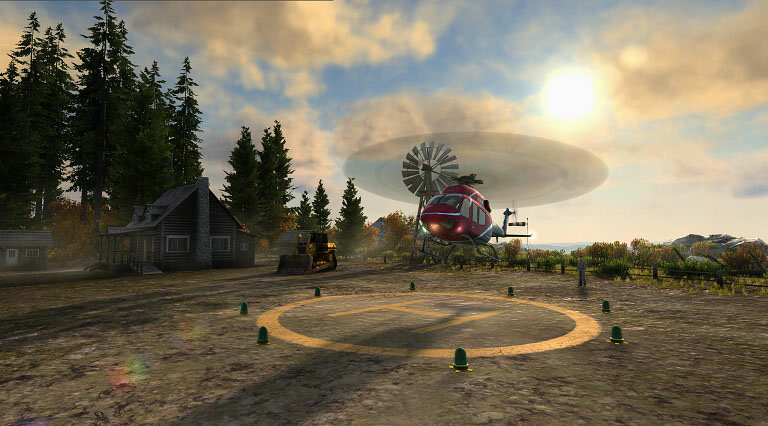 Otherwise, the local transformation of the child nodes will be changed.